As the Marketing Manager at a recruitment firm, I get emails from job applicants. I don’t recruit, my name is NOT affiliated with any job opportunities on our website, nor do I pretend to hire for a position, yet I still get applications. I try my best to forward the resumes but, as of this week I have 3580 emails from job seekers sitting in my inbox, waiting to be forwarded. I am not going to lie, it’s not in my top 10 priorities. So if you are serious about the job you are applying for, address it to the right person. My second pet peeve are the one-liner emails it will be sent to the trash. If you can’t spot the problem then you need help. 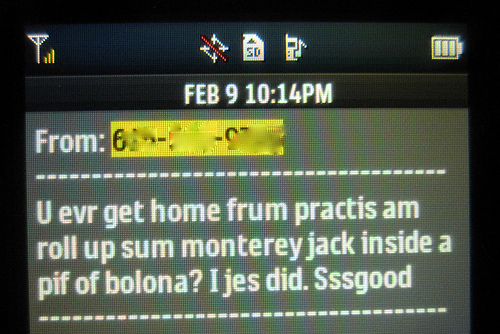 One of my “fingernail to the chalkboard” pet peeves with job seekers are those who use texting abbreviations. There is no character restrictions in an email, there is no need to abbreviate. Out of the two evils I much prefer spelling typo’s than the plz’s, xoxo’s, thx’s. So please stop, take time your time, put effort into your job applications. While I cannot guarantee you will land a job, you will no longer be cast as a lazy idiot.